Some people have date night by going to the movies or out to dinner. We watch The Bachelor. It is absolutely insane I invest any time into this show, but I can't stop. 1. I did not think either Catherine or Lindsay had that great of a dress. Although I did appreciate the foreshadowing of Catherine in gold and Lindsay in silver. 2. Like everyone else, I applauded Lindsay taking off those heels after getting dumped. Who the hell needs to walk in those shoes after hearing, "I love you, but...."
3. I think Sean was the best bachelor we've had. He seemed the most normal. Do you agree? 3. I LOVE his dad. How sweet is that guy? 4. Also Sean's sweet little nephew won my heart last night, when he gently reminded Sean that Emily DID NOT pick him. 5. I wasn't really in love with any of the women this season. I liked that Lesley from D.C. but everyone else seemed a little "meh:" Except Tierra. She was just awful. What were your thoughts? 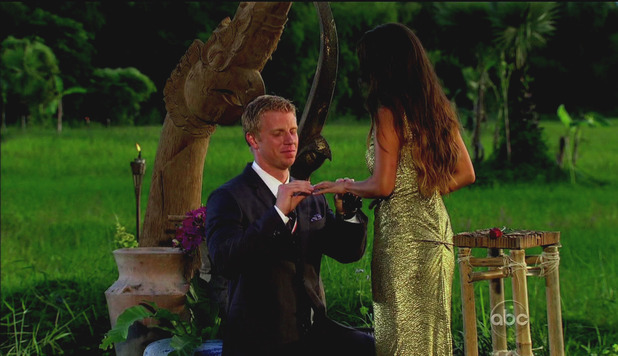 What about Desiree becoming the next bachelorette?